How long is a phrase? Words combine to make phrases, and phrases are one of the basic patterns out of which we build sentences. A phrase is a group of words which acts as a single unit in meaning and in grammar, and is not built round a verb. Phrases can have many different functions in a sentence. They are used as subjects, objects, complements, modifiers, or adverbials. The strange green creatures with bobbing heads spoke. the phrase the strange green creatures with bobbing heads acts as the subject of the verb spoke. The phrase is a single unit both in its meaning and in its grammar. the fragment the strange green is not a phrase, because it has no separate meaning and no grammatical function. A phrase is an expansion of one of the words inside it, which is called its head. For example, creatures is the head of the strange green creatures with bobbing heads. There is a useful notation for showing heads and their expanders, in which the head is written higher than the modifiers, showing that it is the ‘boss’ and the expanders are its assistants, brought in to make the message more precise. The phrases whose heads are by and over are prepositional phrases and will be explained below. A noun phrase does the work of a noun in a sentence. the subject: The red balloon soared upwards. the complement: She wants to be a doctor. Most sentences contain several noun phrases, which often determine the overall length and complexity of the whole sentence. This is why it’s important to be able to focus attention on the noun phrases in a text, in order to discuss their structures and how they are used. Adjectival phrases have an adjective as their head. Adverbial phrases have an adverb as their head. They are really enthusiastic. The adjective enthusiastic is modified by the adverb really to form the adjectival phrase. It is the complement of the verb are. They are keen on football. The adjective keen combines with the prepositional phrase, on football. The head of the phrase is keen, and the phrase describes the keen-ness, so it’s an adjectival phrase. the unusually tall boy The adjective tall is modified by the adverb unusually to form the adjectival phrase. It expands the noun phrase the boy. 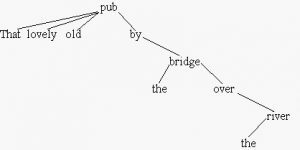 At KS3 one main area of development with adjective phrases is likely to concern the use of prepositions and linking words (e.g. different from, conscious of, accustomed to, sufficiently big to). The preposition is usually followed by a noun or noun phrase – lunchtime, the fridge, etc. This is called its object, because the preposition + object combination is rather like a verb + object (e.g. forgot lunchtime, opened the fridge). Why don’t we treat the preposition as a modifier of the object? Because the preposition doesn’t modify the object’s meaning – for example, behind doesn’t turn the fridge into a particular kind of fridge. In fact, the preposition sets up the meaning for the whole phrase, and the object makes it more precise. For example, behind picks out some place, and defines it in relation to something else – the fridge, Mary, the Houses of Parliament, depending on what the object may be. This is why we treat the preposition as the phrase’s head. from the shop :The head of this prepositional phrase is the preposition from. The function of the phrase is adjectival – it does the work of an adjective by describing the noun boy. It modifies the noun, answering the question: which boy? at the corner :The head of this prepositional phrase is the preposition at. The function of the phrase is adverbial – it does the work of an adverb by modifying the verb waiting. It answers the question: where is he waiting? The boy in a hurry is waiting over there. The boy at the station told me. The boy from London lives here. The boy with red hair is called Ginger. The boy behind the shed is smoking.